An upstate New York man was arrested on Thursday and is accused of threatening Reps. Steve Scalise (R., La.) and Cathy McMorris Rodgers (R., Wash.) via voicemail. "We are going to feed them lead. Make no mistake you will pay," the voicemail said, according to authorities. The suspect is Carlos Bayon of Grand Island, the Times-Picayune reports. He was charged with interstate communication of a threat for threatening both members of Congress. Both voicemails were recorded June 3. Law enforcement officials didn't confirm Scalise and Rodgers were the targets but Scalise spokeswoman Lauren Fine confirmed Scalise was one of the targets. Fox News reporter Chad Pergram tweeted that Rodgers was the second target. 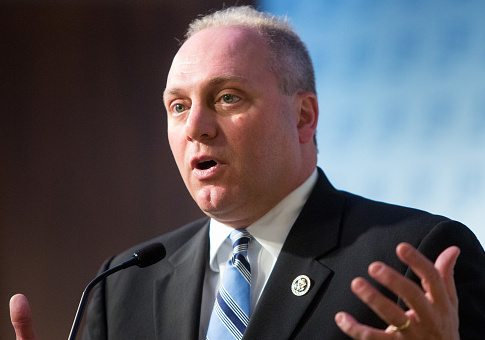 Threats against Scalise are taken seriously after he was a victim of a June 2017 shooting where he and his fellow Republican congressmen were targeted at their baseball practice. The congressman was shot along with four others, but the secret service detail who was with Scalise was able to shoot and kill the gunman. Fine said Scalie's office has no knowledge of Bayon and that the voicemail was received in his district office of Hammond. The messages were reported to the Capitol Police, which ultimately led to the FBI searching Bayon's home. U.S. Attorney James Kennedy Jr. said "very concerning" items were found at the home. Kennedy was asked if Scalie's views on immigration were a possible motivation for Bayon's threats. "I think that's a reasonable interpretation," Kennedy said. "We are convinced that this defendant's threats were credible." "Hey listen, this message is for you and the people that sent you there. You are taking ours, we are taking yours. Anytime, anywhere. We know where they are. We are not going to feed them sandwiches, we are going to feed them lead. Make no mistake you will pay. Ojo por ojo, diente por diente [Spanish for ‘an eye for an eye, a tooth for a tooth']. That is our law and we are the majority. Have a good day." This entry was posted in Politics and tagged Cathy McMorris Rodgers, Steve Scalise. Bookmark the permalink.